The infamous David Duke has endorsed Keith Ellison, the first Muslim to be elected to Congress, to replace Debbie Wasserman-Schultz as the new chairman of the Democratic National Committee. 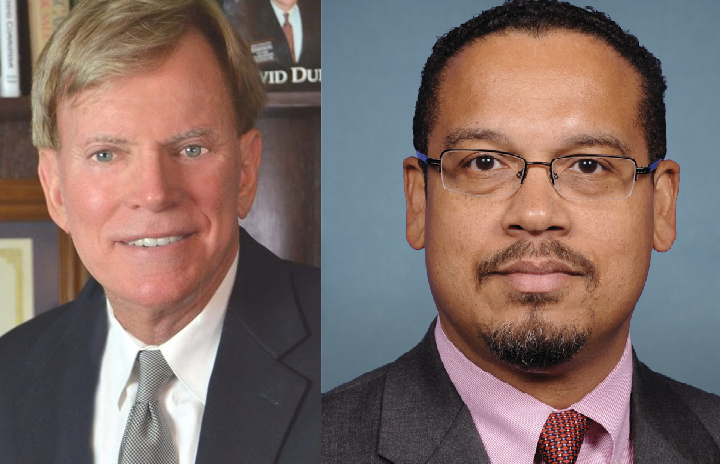 It seems Duke and Ellison may have some common ground, however, as Ellison is currently under fire for alleged previous involvement with the Nation of Islam — who are widely labeled as being bigoted and anti-Semitic. Duke was previously a Imperial Grand Wizard in the Ku Klux Klan, and has no qualms about sharing his belief that the media, government, and federal reserve are all controlled by the Jewish people. “Keith Ellison, Sally Boynton Brown or Jehmu Greene would all be excellent choices – I really like Keith though… I mean, at least he knows,” Duke tweeted. In 2006, Ellison wrote to the Jewish Community Relations Council of Minnesota and the Dakotas claiming that he has “long distanced himself” from the Nation of Islam, in part because of their anti-Semitic sentiments. “I have long since distanced myself from and rejected the Nation of Islam due to its propagation of bigoted and anti-Semitic statements and actions of the Nation of Islam, [its leader] Louis Farrakhan, and [Farrakhan’s late assistant] Khalid Muhammed,” Ellison wrote. Once Ellison was elected to Congress however, his sentiments towards Israel and vote against funding the Iron Dome was not viewed favorably by those who support Israel. In 2010, things escalated even further when Ellison was secretly recorded stating that American foreign policy is “governed” by Israeli interests, the Times of Israel reports. He was subsequently accused of being “an anti-Semite and anti-Israel individual” by Israeli Democratic Party mega donor Haim Saban. Things eventually settled down, but have been reignited due to a new report on Ellison’s past from Mother Jones. According to their sources, he did not denounce the Nation of Islam as long ago as he claims. What’s good for the goose is good for the gander, as they say.